The Internet of Things (IoT) and the emergence of digital skills has helped a North Yorkshire manufacturer boost turnover by 21% in the last twelve months. It has enjoyed particular growth in the Fast Moving Consumer Goods (FMCG) and Medical markets, where the company’s new cloud based ‘Omni Feeder’ technology has been fundamental in securing new contracts. Bosses made the announcement during the EEF-backed event held at its Tadcaster headquarters, which provided over 80 delegates with an insight into the growing Impact of the 4th Industrial Revolution (4IR). “2016 was all about investment in our people and new technologies that will continue to give us a competitive advantage over our rivals…the good news is it appears to be a formula that is working, with more than £4m of new sales already delivered in the first quarter of 2017,” explained Mike Lewis, Associate Sales Director at Lambert. 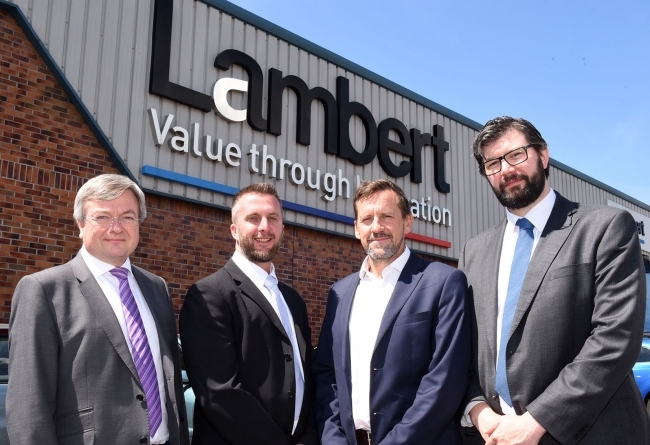 Lambert, one of the worlds’ leading innovative developers of factory automation, was chosen by the EEF to host its latest Manufacturing Connect event on exploring the 4th Industrial Revolution. Keynote speeches form Mike Lewis, Martin Strutt (EEF Consultancy Director), Nick Hussey (Hennik Group) and Warren Harvard (Festo GB) discussed the practices and solutions companies are adopting to optimise their operations and improve connectivity. There were also demonstrations from technology experts Balluff, Rockwell Automation, Staubli and Festo GB, not to mention a guided tour of the company’s impressive facility in the heart of Tadcaster. EEF Consultancy Director Martin Strutt said: “4IR is happening and the UK’s success in this global industrial transformation will hinge on manufacturers’ strategies and ambitions. 4IR goes far beyond simply investing in new technologies and techniques – this new era requires cultural shifts, new business models and the ability to adapt and innovate. Lambert is expecting turnover to grow again in 2017 and, whilst a large number of contracts are again for customers overseas, there is one UK manufacturing plant that is investing approximately £6.6m in automation which will be 4IR ready and capable. This project is in production set-up phase and will start to be delivered later this year and into 2018.